Injury-hit Harrogate RUFC suffered a disappointing home defeat to Alnwick at the Stratstone Stadium. With a number of their key players sidelined, Dave Doherty's side have made an indifferent start to the season, and this most recent loss was their fourth in 10 North Premier outings. The already depleted Aces were rocked by a further setback during the opening minutes of Saturday's game as inside centre Sam Fox - making his first start following a lengthy lay-off with an ankle problem - suffered a head injury as he made a tackle in midfield. With the hosts struggling to really get going, it was Alnwick who shaded things early on and they moved ahead after a quarter of an hour when big number eight James Bird stepped up to boot over a penalty goal following a 'Gate transgression at a line-out. Despite being firmly second best in the scrum, Harrogate then enjoyed a spell on the front foot that culminated in them being awarded a penalty of their own, from which the ball was kicked to the corner. 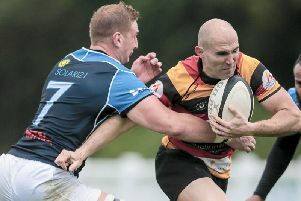 The subsequent catch-and-drive was well controlled, the home pack rumbling over the whitewash where scrum-half Danny Matthews was able to apply a finishing touch. Fly-half Cail Cookland then slotted a tricky-looking conversion from wide on the left to move his team into a 7-3 lead after 22 minutes. 'Gate continued to press and a powerful burst by James Millington got the home side into a position where it looked as if they would add a second touchdown, however the ball was knocked on and the momentum then shifted. The opening period ended with the visitors looking the more likely and only a couple of handling errors saw them denied when well-placed. It looked as if Harrogate would survive until half-time with their lead intact, however Alnwick pressure in the left corner resulted in prop Alan Phillips burrowing his way over from close range to edge the Northumberland outfit ahead. The minutes immediately following the resumption saw the away side threatening once more, but 'Gate then enjoyed a spell where they had plenty of the ball, without ever really looking like they were going to penetrate a stubborn and well-organised visiting defence. They did however manage to edge ahead at 10-8 when a Cookland penalty from a central position just had enough on it to creep over the cross-bar with 57 minutes gone. There was little to choose between the sides during the remainder of the contest, with defences on top until a decisive moment arrived nine minutes from time. A 'Gate hand lost the ball at a line-out and it bounced kindly for Alnwick's impressive flanker James Hamilton to break incisively down the left wing before offloading to the supporting Bird, who raced clear and touched down. 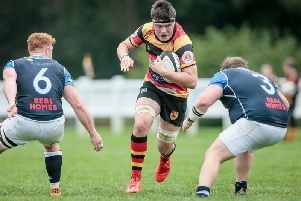 Doherty's men worked hard to try and force their way back into the game during the closing moments, but didn't have the creative spark within their back-line to engineer an opening and the final whistle sounded with the visitors still 13-10 up. Defeat sees the Rudding Lane outfit drop two places to fifth in the league table and they are now 11 points shy of the division's one promotion play-off spot.